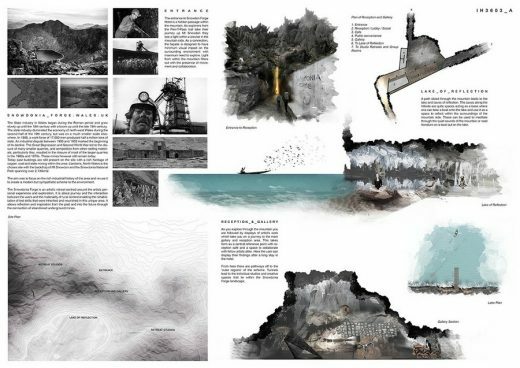 OPENGAP organizes the fifth edition of this open ideas competition seeking for innovative, cutting-edge, contemporary, proposals, committed to a strategy of implementing architecture in a natural environment. Approaches should point to find synergies between nature and the building itself. Each participant or team can propose the location of their Project. This design competition is open to all architects, designers, architecture students and to people around the world interested in the topic. Competitors could subscribe individually or as a team of maximum of 5 people. The proposal submission consists of two digital panels in .jpg format, not bigger than 5MB each. This architectural competition is open to all architects, designers, architecture students and to people around the world interested in the topic. Competitors could subscribe individually or as a team of maximum of 5 people. 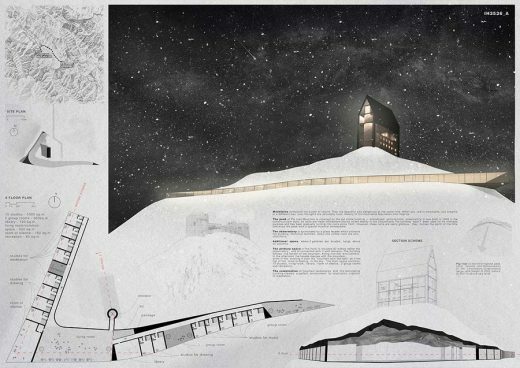 The winners of 2015 A HOUSE FOR… Ideas Competition, organised by Opengap, have been announced. In the city of Guadalajara, México on January 23, 2015, the Jury Members met at Avenida Cubilete nº 95, Col. Chapalita, to evaluate the proposals submitted under the competition. All Jury Members received previously the proposals in digital format and the competition bases to allow sufficient time to prepare the Plenary Session. Previous to the proposals review, the competition organizers state that the proposal IH3804 was received after the deadline. The jury decided not to include this proposal in the competition for not complying the procedures specified in the bases. The Session was formally opened making reference to the competition bases and the manner to proceed in accordance with the criteria established therein. The first step was then displaying all submitted proposals. The Jury began its deliberations and choose to make a generic study of each of the proposals and make a first selection of those which have received support from at least one member of the jury following the suggestion of the Organization. This first selection consisted of 33 proposals. starting from a very simple structure it generates a multitude of very interesting interpretations. this place can become one of the most inspiring reasons for users. space with unique genre, directed exclusively to the spirit of artistic creation. nature, evoking the contemplation, which must be continually in the work of an artist. project with the natural element. spaces but with a contemporary language. good relationship with both internal and external users. 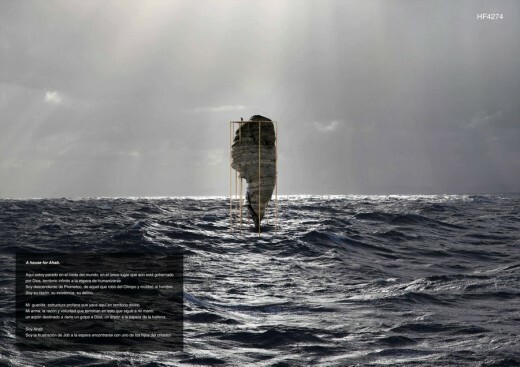 The graphic quality and representation of the project are remarkable. 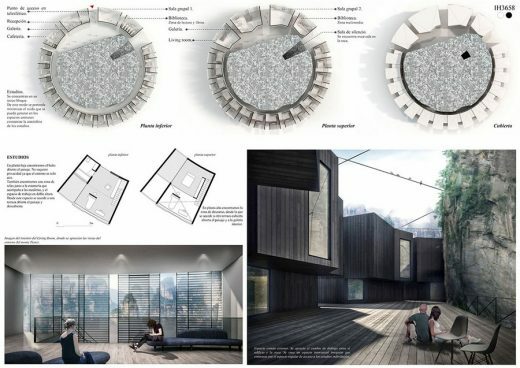 Second edition of this international competition organized by OPENGAP, inviting participants to explore the boundaries and paradigms of house designing, inciting them to work in innovative and visionary proposals which can both, think in a basic housing program and in the relation of identity between the customer and the project. Each participant or team can propose the client for designing a house, a person of interest and inspiration for the project. 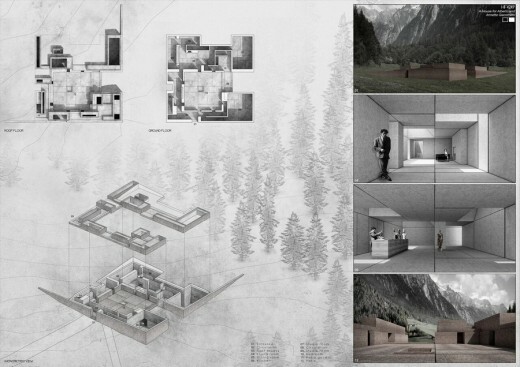 The winners of A HOUSE FOR Ideas Competition, organized by Opengap, have been announced. The proposal offers and rightly binds the place, the character and the architectural project in such matter, that none of these aspects can be understood without the others. The complexity and strength of the proposal comes from the relationship of these three main points of the competition. A very poetic project that leads us to ponder on the idea that architecture is also the place and the place is the architecture. It conveys the emotions of a character like the Minotaur and leading us to reflect on his way of living … more than his way of inhabiting. This is a clear, concise, forceful and brilliantly expressed proposal. 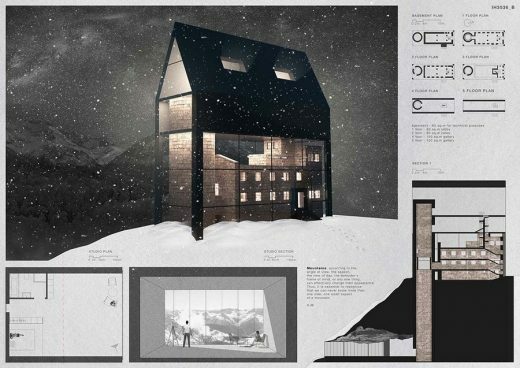 This proposal has a great success in choosing a character that fits perfectly with an idea, playing with the ruin fascination in architecture and following along with an actual program. It presents a project that can be from any time, a building that is “born ruin.” It is a great architectural exercise that has the merit of generating a high spatial complexity, starting from a very simple structure. The project plays with the perception of time and space concepts interlacing the inside and outside, the past and present. Noteworthy is the high graph level of the proposal. The idea is presented with indisputable clarity. The election of Fernando Pessoa as a client is very interesting and of great wealth, and that is presented as a “character of characters” Like the protagonist chosen, the project is read as a single object set in four different cases. It is very remarkable the spatial quality achieved by the project, starting from a simple gesture. 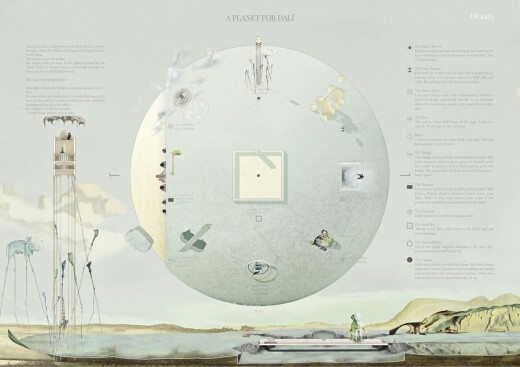 The proposal addresses all aspects of the competition in a poetic, authentic and forceful way. OPENGAP organized this open ideas competition seeking for innovative, cutting-edge, contemporary, proposals for a new kind of public space that hosts activities related to street art, fostering a climate of creation, education and relationship of users with street art. Participants were invited to conceive a space to give urban culture an alternative where to merge the public use with a space of artistic expression and learning; to work on a proposal to brake old established paradigms about street art. 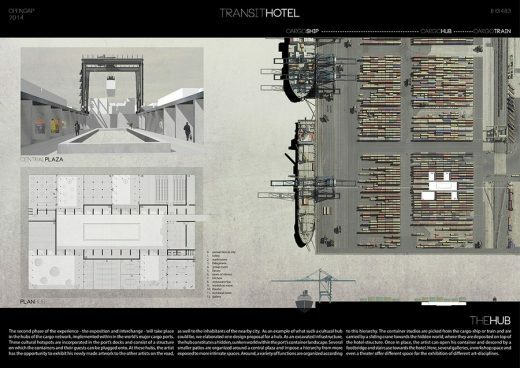 Each contestant or team was able to choose the urban context in which to locate their project. 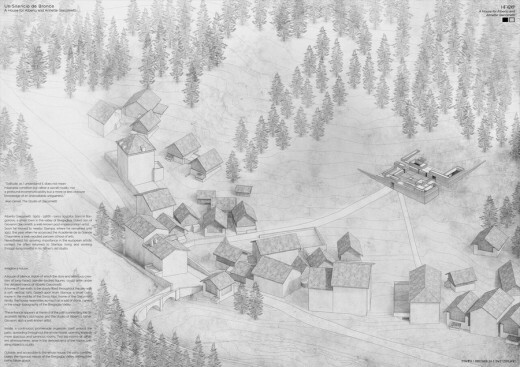 However, the proposal had to justify the choice of location, as well as to explain the way in which the site and the project will interact, creating synergies with the surrounding urban environment. The project is located at “ La petite Ceinture” which is a former railway closed to traffic since 1934 and replaced by the crowded Ring Road. It still circles the city of Paris. It has a length of 23 Kilometers and a dozen of neglected railway. This project invites inhabitants, walkers, travelers to drop the network of the Parisian subway in favor of a slower and poetic journey where each station becomes more an event, than just a geographical destination. Workshops and studios take place over the metallic ribbon, linked by the former train, where the users can take a gourmet break. It is conceived as a giant outdoor plaza all around the city. Artists, dancers, musicians seize all places and resuscitate this itinerary which becomes a stage, but also an inspiration. 38 ¤ KOREA is a manifesto against conflicts of two countries divided by the DMZ (border); a 250km border surrounded by landmines, explosive military barricades. 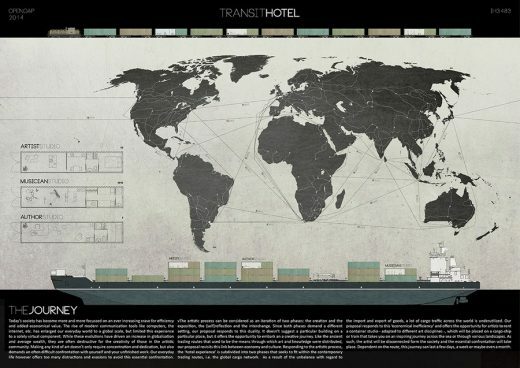 Using architecture and urban art as a socio-political tool the aim of our intervention is to evaluate their capacity of influence in a social context and how we can use them to recycle the border and its concept. 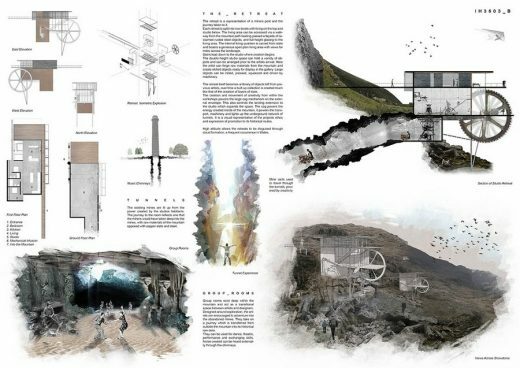 The architecture of the proposal has been conceived by recycling the environment, composed of military elements, transforming them into functional spaces that expand from the border. Therefore, this intervention is an improvised space, created by the inhabitants interpreting the dividing boundary in one unified over time. “The aim of the proposal is to animate a 22 storey high abandoned concrete skeleton of a residential tower (part of the ‘Regatta Quay’ scheme) by the docks in Ipswich, UK. Street art develops its life in urban settings and it cannot be fully controlled. The street artist uses the existing urban elements as a canvas. Therefore it is important to view this scheme as a place rather than a building which represents elements of urban life. The proposal consists of themed gardens vertically stacked; Memorial Garden, Moving Sculptures’ Garden, Birds’ Garden, Swing Garden…etc. 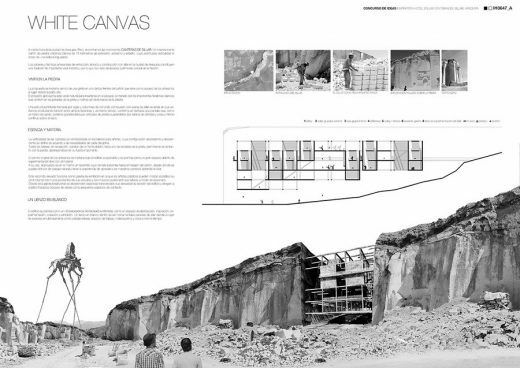 The proposal mainly preserves the existing structure. Some floors have been removed to create double or triple height spaces. A timber staircase sits in the centre of the former car park’s hydraulic lift shaft and directs the visitors from the docks to the roof where the cemetery/ memorial garden is placed. The 320 step staircase allows the visitors to view artworks while walking up the stairs. The concrete frame is partially covered with Stencils that were created by the graffiti artists in the studios and could act as facade screens. A three storey market place inspires artists to sell their work as well as the locals to sell food and has nice views of the docks. The artists’ studios, offices and changing rooms are placed at the back of the building and the artists can choose to remain anonymous. 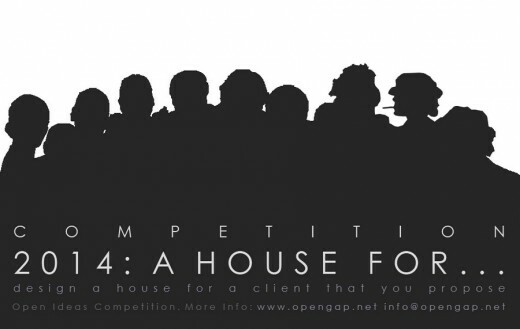 OPENGAP invites participants to explore the boundaries and paradigms of house designing. To work in innovative and visionary proposals which can both, think in a basic housing program and the relation of identity between the customer and the project. 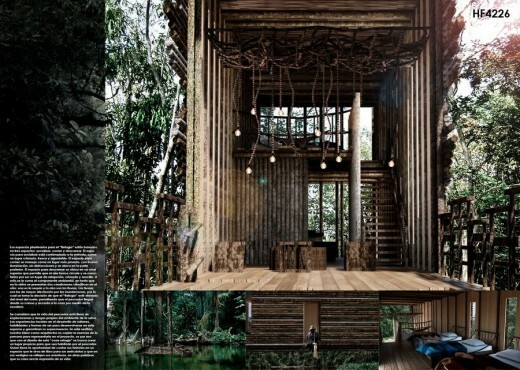 Each participant or team will propose the client for designing a house. This will be a person of interest and inspiration for the project. – Mentions, Mentions will not have an economic prize. OPENGAP organizes this open ideas competition seeking for innovative, cutting-edge, contemporary, proposals for a new kind of public space that hosts activities related to street art, fostering a climate of creation, education and relationship of userswith street art. Participants are invited to conceive a space that gives urban culture an alternative where to merge the public use with a space of artistic expression and learning; to work on a proposal to brake old established paradigms about street art. Each contestant or team will be able to choose the urban context in which to locate their project. 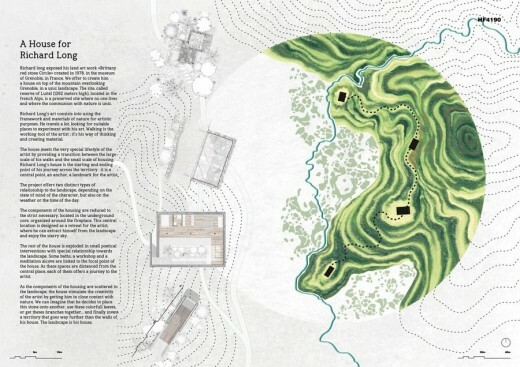 However, the proposal will have to justify the choice of location, as well as to explain the way in which the site and the project will interact, creating synergies with the surrounding urban environment. 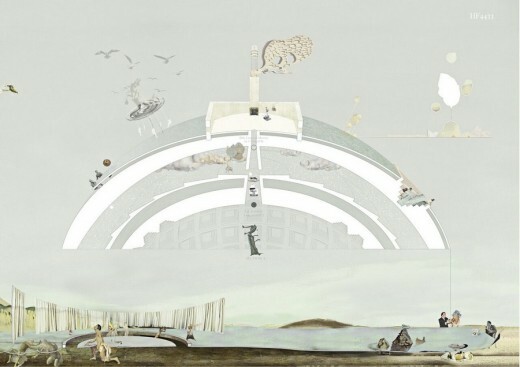 OPENGAP organized this open ideas competition seeking for innovative, cutting-edge, contemporary, proposals regarding a new concept for artistic inspiration spaces. Participants were invited to design a place focused on the rental of spaces that motivate creativity and concentration, allowing users to focus, inspire and develop their artistic ideas. Each participant or team defined the location of their project. A clear, resounding, masterfully expressed and refined aesthetic proposal. Creates an object with a poetry based in strong and timeless principles such as the barracks of the Albufera and enhances the traditional architecture of the place. The site selection is also very ingenious and suggestive. The project, in itself, creates a new place, conceived as a machine, an instrument to absorb the environment and create new and unusual landscapes. The central “patio” offers a unique and unrepeatable space. Puts on an intrinsic value a characteristic of good architecture that is rarely seen today: the reminiscent capacity of a work piece, the power to make us look inside ourselves as individuals and as a species The spatial quality of the interior is also spotless. The way each module intertwines with the others generates a remarkable spatiality. A proposal deeply linked to reflection, to remembrance and also to that good nostalgia that makes us susceptible to creation. The proposal offers a wonderful place. 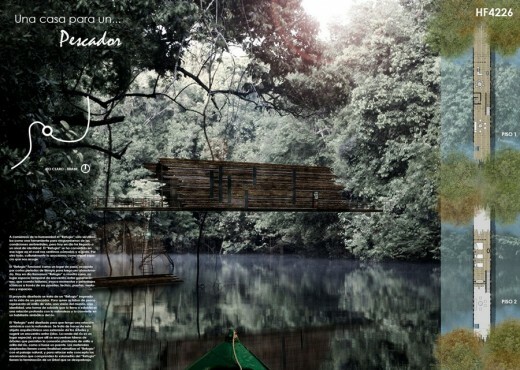 It enhances the site and bows to nature, resolving the program in a forthright way. The concept behind the proposal is as good as the resulting project. It breaks through the landscape with a forceful gesture and sharp cut, as an indelible mark on the site. The graphical level of the presentation is also very remarkable. 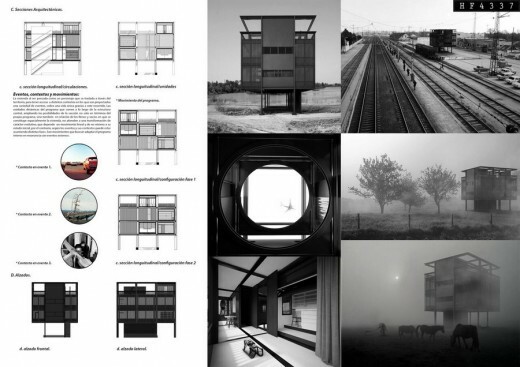 This is a project that denotes the authors’ skills with a remarkable level of development and a very effective resolution of the interrelationships of the different spaces. It achieves a profound dialogue with the landscape through its heavy and stony materiality, rooted to the ground where the nature and artifice intend to merge. 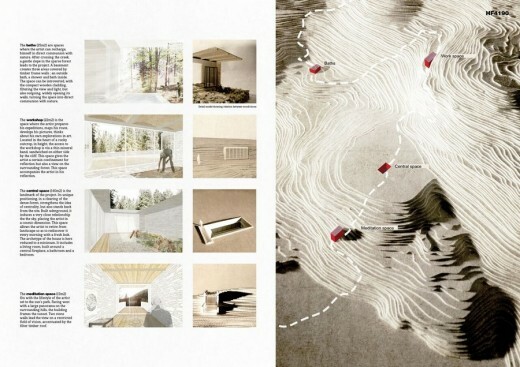 It values the privacy of the different spaces for the artists and offers a privileged view of the countryside. 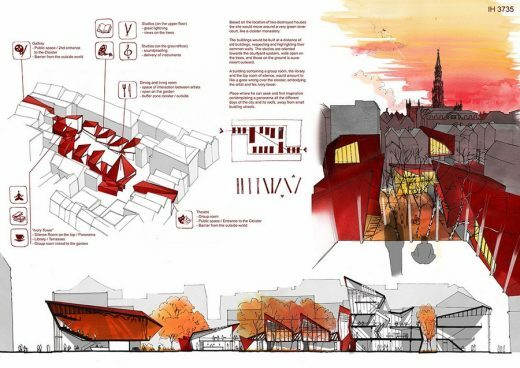 This proposal retrieves a place for the city greatly valuing the public space with art as a motif. 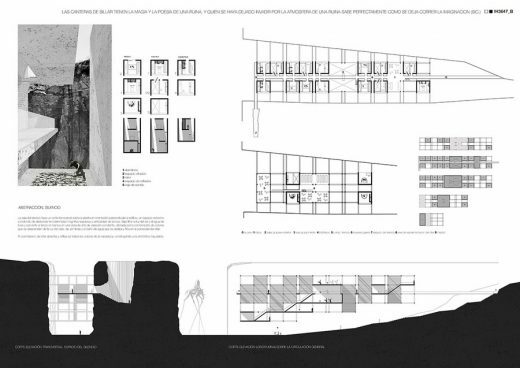 The references between the original use of the space and the proposal are metaphorically well achieved. It presents nature as the protagonist of the staging space. 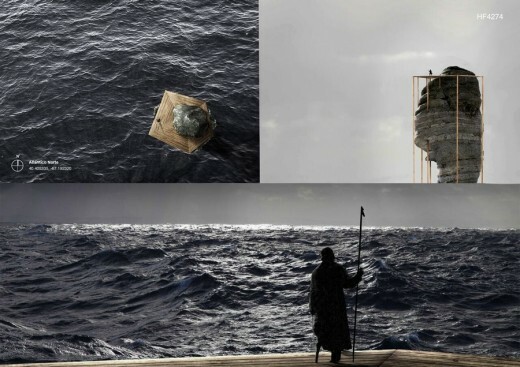 The idea is presented in a clear and impeccable conceptual sequence. 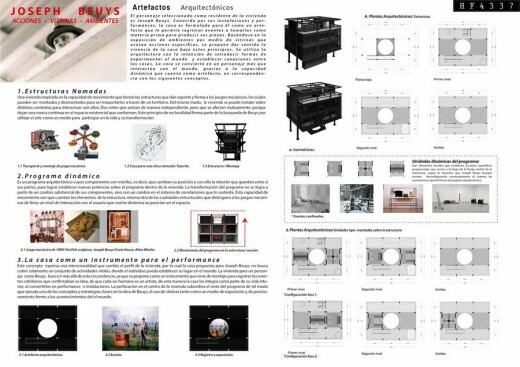 The project has the value of the complaint and the criticism in a time and context in which the dissertation on conventional values of architecture and consumer goods it welcomed. The approach of giving a public use to the buildings, that are inert due democratic absolutism is extremely thoughtful and courageous. From a proactive stance, this project extends the competition program by giving to it a fascinating new dimension. 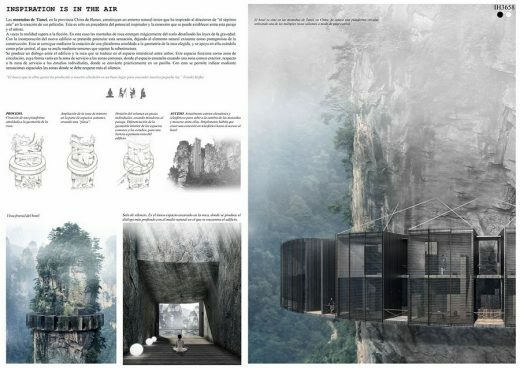 It solves the living and creating inscribing them in an attractive adventure.It recognizes the conceptual and poetic value of the proposal, highlighting the possibility of transfer of the whole and the possibility of separating the core individual spaces. 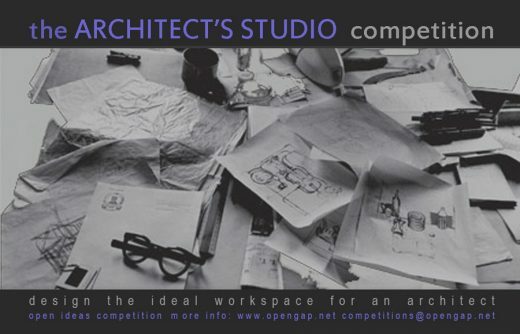 OPENGAP organizes this open ideas competition seeking for innovative, cutting-edge, contemporary, proposals regarding a new concept for artistic inspiration spaces. 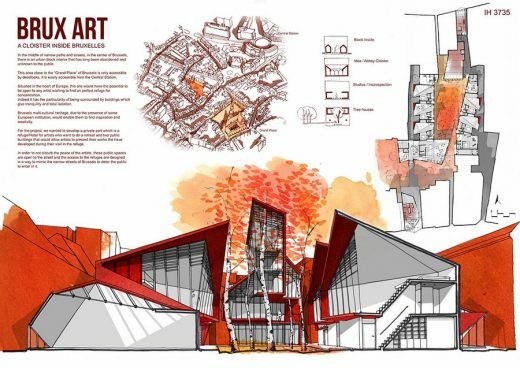 Participants are invited to design a place focused on the rental of spaces that motivate creativity and concentration, allowing users to focus, inspire and develop their artistic ideas. Each participant or team will define the location of their project, however, the proposal must justify the choice of the location. The design contest is open to all design teams that fulfil the architecture competition eligibility requirements. Each design team must include an energy-technology expert. December 31, 2015 in Competitions.